In a recent post, I shared with you how I found a free frame and used it to display one of my mother-in-law’s doilies. While I was writing that post, I realized that I had never shown you the guest bedroom that I was itching to change. Our cottage actually has 3 bedrooms, but we use one as an office. Our guest room is really small, barely large enough for the small amount of furniture that we have in it. The walls are painted Coffee by Valspar. Actually, all 3 of our bedrooms are painted this color. It is a very versatile color, and we have not tired of it for the past two years that we have lived here. We’ve had the iron bed for a number of years. We used it in the guest room at our other house. It has great details, and it’s color is bronze. Sturdy as a rock. The mirror over the bed is metal. In our other house, we used it over our dresser in our bedroom. We couldn’t use it over the dresser in this house because we have a TV over it now. 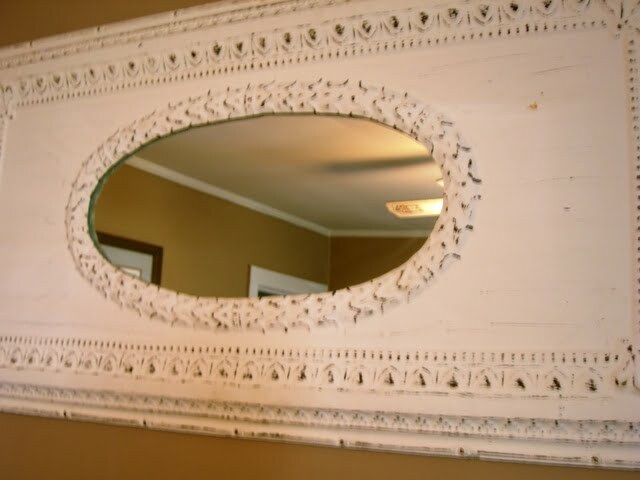 I still love this mirror, even though we’ve had it for at least 12 years or so. I’ve always liked the comforter, but I’m ready for something that is lighter and a little more cottagy. Is that a word? If not, you know what I mean. Rascal likes the comforter. 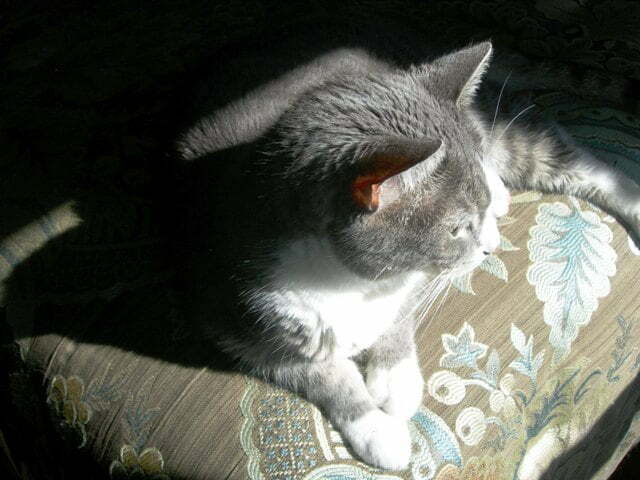 This is his favorite place to take a nap in the sunshine. Rascal is almost 12 years old. Isn’t he the handsome one! There’s a small vanity in this room. It’s too shiny and looks too new, so I’m going to paint and distress it soon. Above the vanity is a painting that was a wedding gift to us 15 years ago. On one wall hangs a print that Leo has had forever. 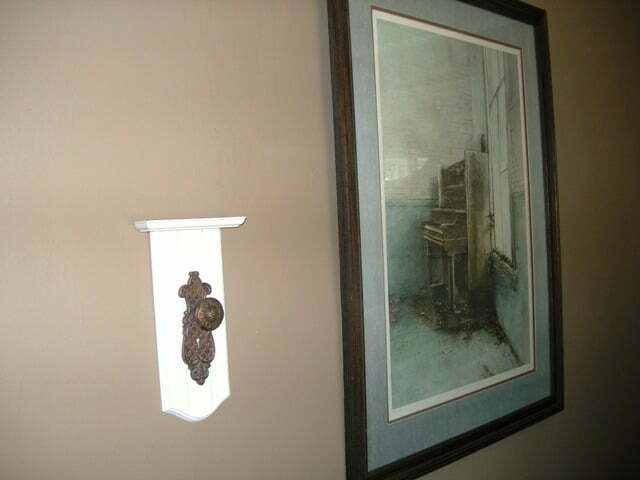 It’s one of his favorites because it reminds him of a piano that was in an old abandoned house near here when he was a child, and it looked just like this one. There’s a small chair in the room. It swivels and rocks. It used to be in our bedroom. 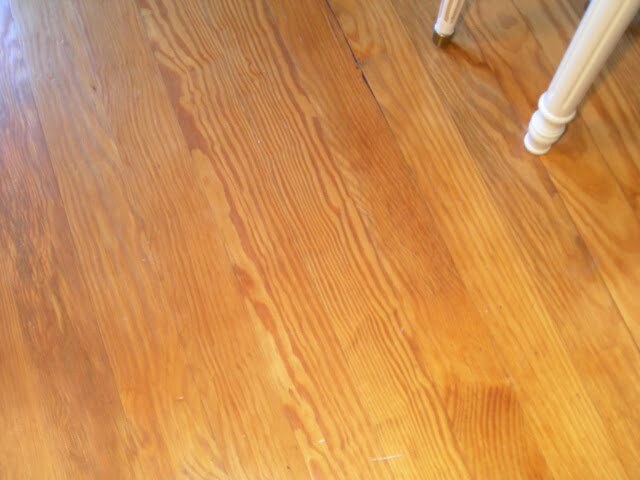 The pine floors throughout the house refinished beautifully. 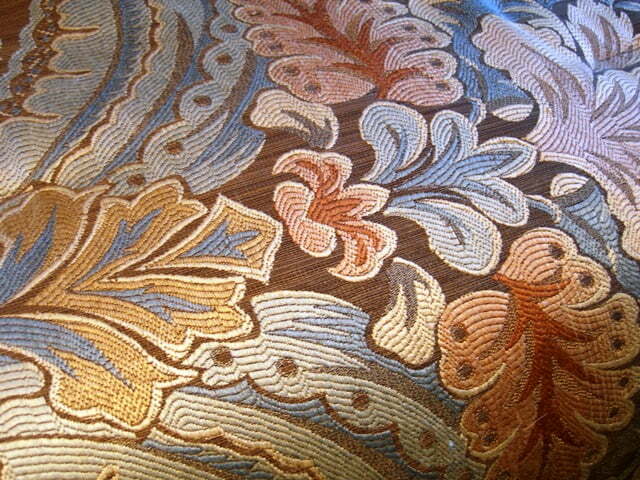 They had been covered up by carpet since the late 60s. 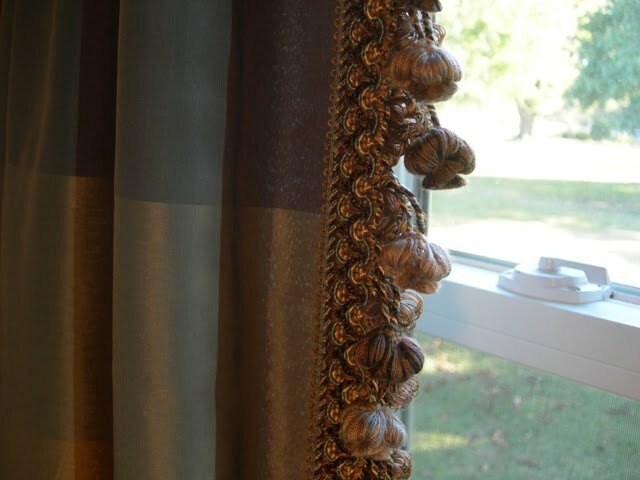 Here’s a closeup of the window treatments. They were inexpensive, but I dressed them up with trim. On another wall hangs my perfume cabinet. 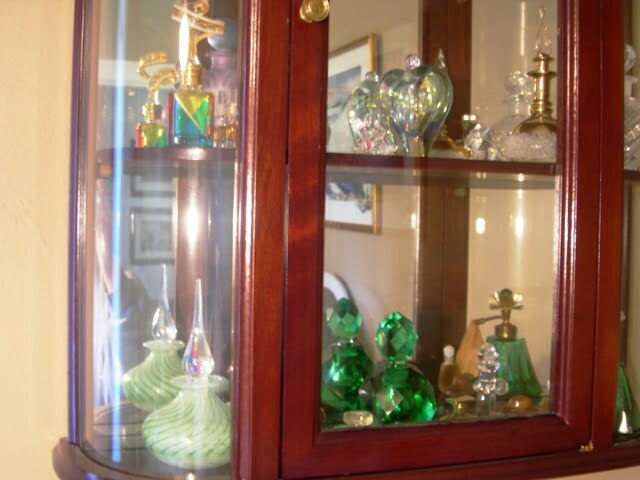 I collect perfume bottles, but I haven’t added to the collection in a long while. The cabinet is going to be painted, too. And I think I’m going to remove or cover the mirror in the back of it. There’s a little dinky side table in here. It’s either going to get replaced or repainted. Take a good look at this room, because the next time you see it, it will be different. All because of a free, oval frame. Leo made the first comment on this post. It’s just not printable!!! I did not take the full tour, but will soon. Your guestroom is wonderful it looks like Rascal is right at home there. I have to go plant my fall green beans. Love the guest room. Sorry to hear you are changing it. Oh, nice to know someone else’s husband makes comments that are sometimes unprintable! Your plans for the guest room sound wonderful. When will it be done, so we can time our arrival? Love the mirror. Can’t wait to see the changes you make! I had to laugh at your recent comment to me, because as soon as I put that blogpost up I left 2 scales on the shelves and put a rooster in the middle. hah! Your drapes are lovely, they look very rich! 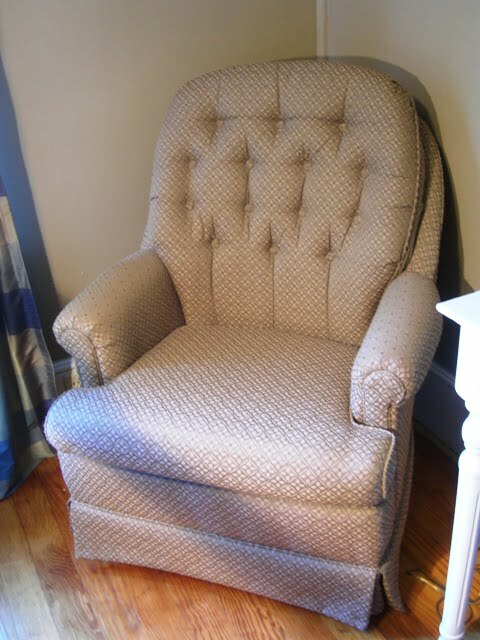 Love that chair, hard to find a size like that . I looks very comfortable and looks great there! can’t wait to see the re-do! you always do beautiful makeovers! Pretty room – love the bed and the hardwood floors! Oh and your pets are darling! Have a nice weekend! The wall color in your guest room is so pretty! 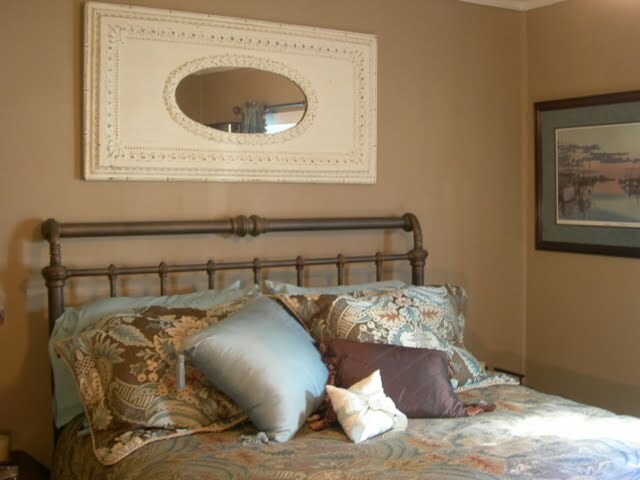 Luv the iron bed in bronze and the mirror is perfect! 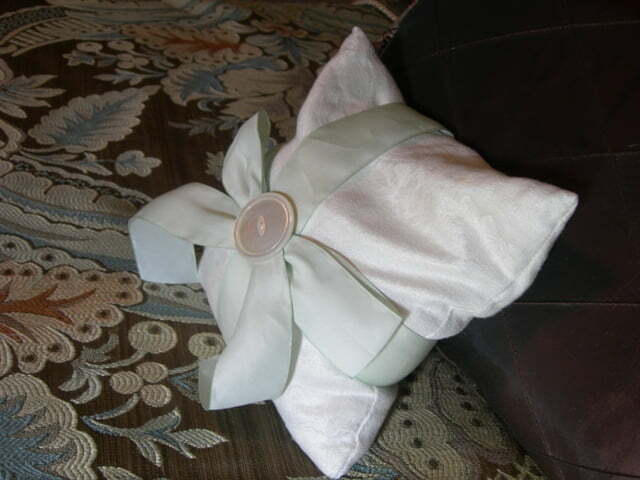 And what a cute little pillow in the last picture! 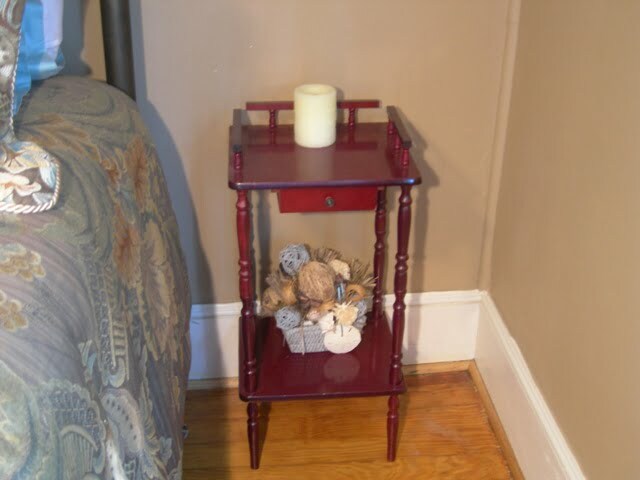 Thank you for sharing your lovely guest room at Potpourri Friday! Wish I could stay the night! You know with that bed you’re the envy of blog world!! 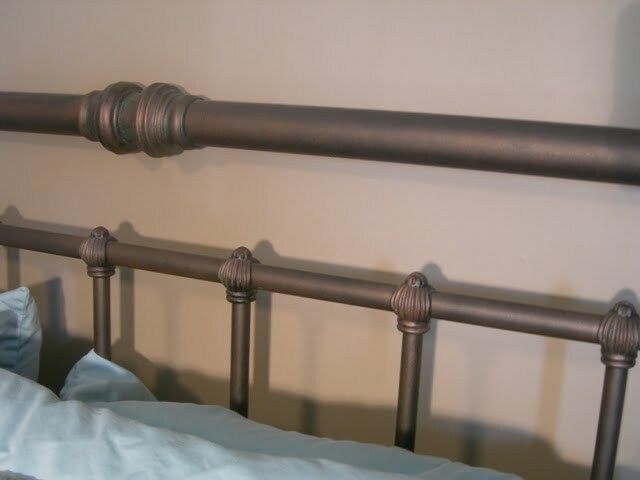 Nothing like a gorgeous metal bed!!! Thanks so much for sharing your room with me and for the sweet notes back at my blog on my fireplace being painted white!!! 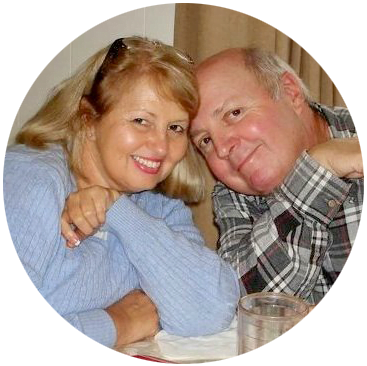 I’m so glad to know about your site and I’m now your newest follower!!! I hope you’ll follow me, too on your next visit!!! The guest room looks great as it is but I can see some of the changes looking great too. I am excited to see the new changes. Good Luck. Love your gorgeous guest room! Those are my favorite colors. 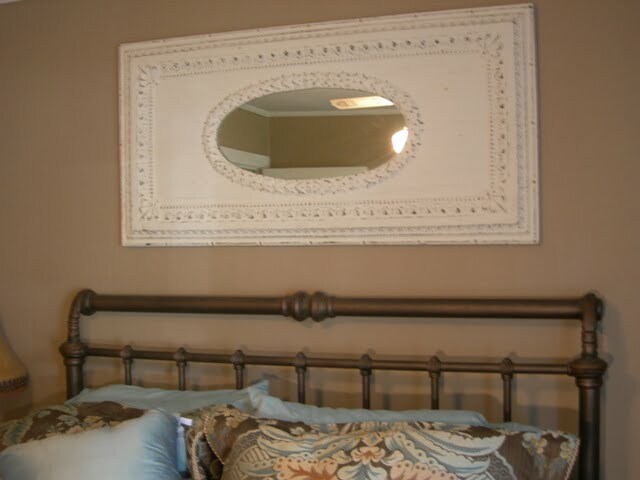 And the iron bed and mirror are fabulous! Beautiful!!! I love that bed. the mirror is lovely, Jane …I love the colors you chose for this room pinks and silver are wonderful together. I posted about your 100 th post giveaway, that i happily won ! Yea… it is so cool ! I love the wine glass ! This is such a pretty guestroom! I love the paint color and how the bedspread ties everything together. 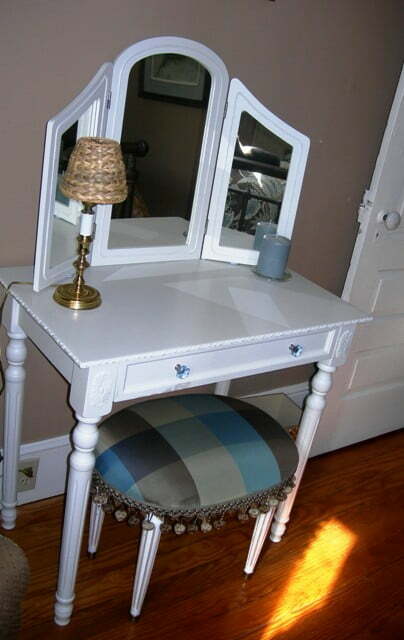 And of course the mirror…I love it! All the changes you want to make sound beautiful! And it looks like Rascal is your number 1 guest!! I love the colors in this bedroom! It is pretty Jane. The room is beautiful, can’t wait to see how you will improve on it. I so want that mirror over the bed. I love it, that is something to hang on to forever. Beautiful guest room. Love these colors!! I can’t wait to see the finished product. I love that mirror over the bed! What fun to redo I made your broccoli cheese corn bread yesterday Gave one to my friend thanks for the recipe. 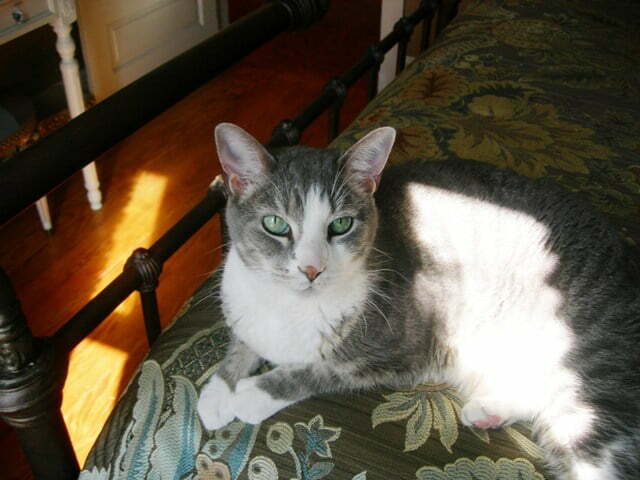 Yes, Rascal is handsome!! Love the iron bed and the mirror. I have the old hardwood floors too and love them! I would take hardwood over carpet any day, and these older floors have such character to them. 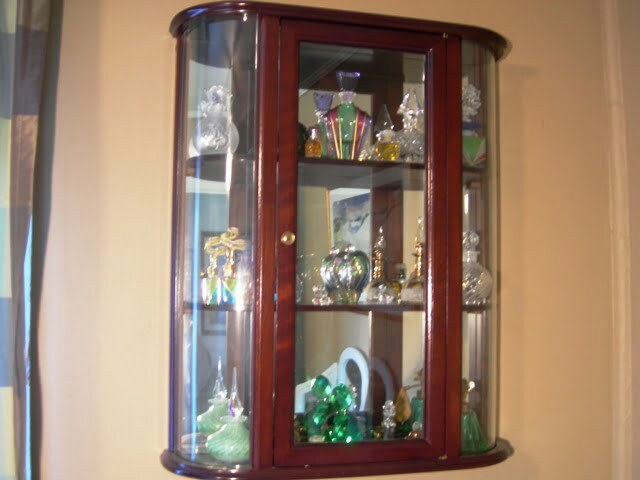 Your perfume cabinet is lovely, admiring the pretty bottles inside. Jane, your guest bedroom is beautiful and inviting! 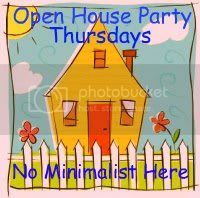 What a nice place for your friends and family to come stay in the warmth of your home. Have a blessed night! Your’s is the second guest bedroom I’ve seen today! It is so pretty. Looks cozy and it looks like you’ve thought of everything to make some lucky person comfortable! Hi Jane…your guestroom is so pretty. We have colors similar in our bedroom and guestroom. 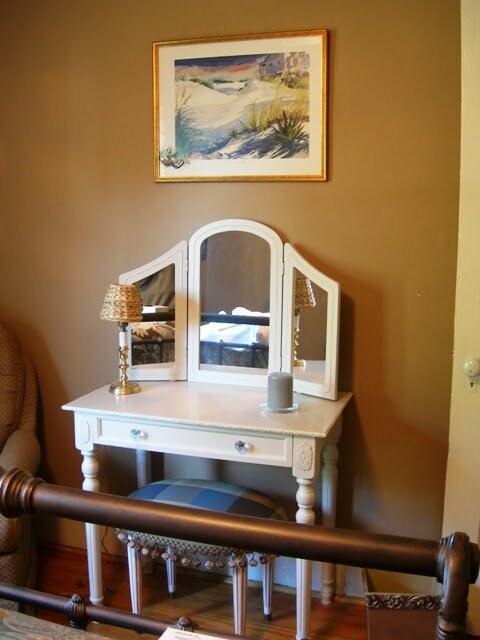 Pretty iron bed too, and I love the mirror. What I wouldn’t give for wood floors underneath my carpet. I don’t think it’s there though. The mirror over the bed is perfect. Can’t wait to see what else you do!